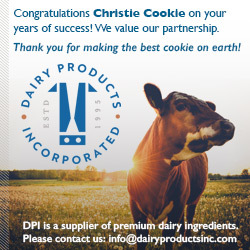 When someone bites into an item from The Christie Cookie Co., they can be confident in the fact that their treat was made with made with the best ingredients possible. These range from 100 percent real butter to Madagascar bourbon vanilla to chocolate chips from sustainably farmed cocoa beans. Christie Cookie, which is celebrating its 35th anniversary this year, offers its signature cookies, brownies and frozen dough pucks in various sizes. Founder Christie Hauck started the company in 1983 with a single store in downtown Nashville, Tenn.
Today, Christie Cookie operates from a production facility in Nashville’s Germantown area. The location, which employs a staff of more than 100, bakes more than 100 million cookies annually. Nevertheless, each batch is hand measured before it leaves the plant. Christie Cookie offers a frozen dough line, which its clients use to bake products, and a pre-baked line of items. The latter, Budd notes, are particularly popular with fast-casual clients. “They’re all looking for some consistency in product and consistency in ease of service on products,” he explains. “Our pre-baked items are easily able to help them out, because they just thaw and serve. “We’re seeing a huge uptick in that category for the many customers we deal with,” he says, noting that Christie Cookie also provides convenience by including sealable cookie bags and stickers with each shipment. American Airlines appreciated the quality of Christie Cookie’s products, and now serves its pre-baked chocolate chunk and snickerdoodle cookies. “It’s a great company to be aligned with,” he says. Christie Cookie is focused on growing its brand. Recently, the company added a cookie kiosk in the Bridgestone Arena where the Nashville Predators play, Budd says. The company also participates in Nashville’s Music City Food + Wine Festival, where it debuted its Nashville Hot Cookie in collaboration with Hattie B’s, “which has been very popular,” Budd says, noting that the chocolate cookie features cinnamon and spices. “It’s got a little kick at the end, which gives it a flavorful twist.” Christie Cookie regularly partners with numerous Nashville-based restaurants and chefs who use its product to create signature desserts. The Christie Cookie Co. takes pride in its home of Nashville, Tenn. “On these legendary sidewalks, you’ll hear three-string chords floating through open doorways as local troubadours warm up for the first set of the night,” it says. “Weathered bricks of famed auditoriums testify; it’s the good stuff that lasts,” Christie Cookie says. “Anything is possible in this place. “With conviction, we cross the doorframe to our own little piece of Nashville authenticity – the Christie Cookie bakery,” the company says. “We tie on crisp white aprons, honored to prepare the signature cookies our customers crave.” Nashville locals also don’t have to go to stores to get a taste of Christie Cookie. Its headquarters features a bakery storefront where they can buy cookies, brownies, muffins, gift tins, coffee and branded merchandise. “Nashville’s our muse, our home, our way of life – we wouldn’t have it any other way,” the company says.